Explorers view a new landscape with new eyes, generally a landscape unlike anything they had ever seen, and as newcomers in a new land their first impressions are all the more valuable. Later, settlers adapt and adjust to the new landscape, gradually absorbing it as they possess it as their own, often taking several generations to become comfortable with it. In this theme we will read of the explorer’s first impressions of the new Australian landscape during the nineteenth century. As most of these intrepid explorers were British, the landscape they explored was often compared with Britain. In terms of landscapes, the late eighteenth century in Europe was the time of the picturesque, landscapes good enough to be a picture (See theme: Landscape Art). This had emerged from the sublime -that which viewed immense mountains or waterfalls but from a safe viewpoint. The picturesque had endured but was supplemented in the nineteenth century with Romanticism – conveying the feeling of the landscape rather than cognitively interpreting it as in the picturesque. Table 1 summarizes the explorers whose journals are the subject of this theme. Eighteen explorers and a total of 48 separate explorations are included. Explorers invariably wrote a journal of their exploration often under the most trying of circumstances. On their return, they edited it and prepared a fuller account based on it. Other writers would also write about the exploration drawing from the explorer’s account and from their journals. The original journal conveyed the most immediate reactions and impressions of a place and often gave the emotional content regarding their personal feelings and reactions to the country being traversed. Subsequent editing might remove this “subjective and emotional” content, preferring the account to be factual and objective. However, it often lost its raw edge in the process. The focus in this theme is about their subjective impressions of the landscape, the extent to which they wrote about the beauty (or otherwise) of the landscape, their feelings about it, and whether it reminded them of home or other places. The explorer’s team generally included an artist to capture scenes of the country traversed. Prior to photography, this was the only way by which a visual record could be made. However, unlike the camera which cannot lie, artists used licence to create images more acceptable to the consuming public of the time. Thus many fitted the criteria of the picturesque in particular, mountains were elevated, trees made to look more appealing and placed so as to lead into the scene, and often Aborigines were included almost as a decoration. It is noticeable in the explorer’s accounts that where water was scarce, much of their writing was about their daily search for water. Where water was available, they wrote about other things – weather, land, vegetation, rivers, animals. Surprisingly, even when they were in dire circumstances – lack of water, endless spinifex (very prickly) or scrub, rocky, barren country, they often commented on the landscape, both positively and negatively. The explorer’s most important role was to possess the land in the name of the Crown. This was a key role and explains why they traversed such large expanses of Australia. As the colony grew, the necessity to provide pastoral and agricultural lands gave impetus to explore further. At the time, the areas through which the explorers traveled were regarded as in their pristine condition, unchanged by the hand of man. Later research has indicated that in many areas, this was not so. Aborigines used fire regularly to open the landscape and prevent it being covered with scrub. Nor was the land uninhabited (terra nullius), most expeditions encountered Aborigines often in large numbers and tribes with whom they interacted, generally on a friendly basis. On his first view of Australia at Point Hicks in eastern Victoria on 19 April, 1770, Captain James Cook wrote: What we have as yet seen of this land appears rather low and not very hilly, the face of the Country green and woody but the sea shore is all a white sand. Cook was not usually given to subjective descriptions; his are very objective and factual. However, a subjective element crept into the following description: the Country which had a very agreeable and promising Aspect, the land is of moderate height diversified with hills, ridges, planes and Vallies with some few small lawns… (Beaglehole, 1968). Of Botany Bay Cook wrote: altho wood is here in great plenty yet there is very little variety. The largest trees are as large or larger than our oaks in England and grows a good deal like them and yields a reddish gum,.. (Beaglehole, 1968). By 1800, 12 years after the arrival of the First Fleet, and with the colony desperate to find arable lands, the Blue Mountains still presented an impenetrable barrier to the west. George Caley, attempting to find a route in 1804, wrote of the dreary appearance, abruptness, intricate and dangerous route we experienced at this place, induced me to call it the Devil’s Wilderness. There were many other references to dismal Blue Mountains due to the failure to cross it, and it was not until May 1813 that it was finally crossed by Gregory Blaxland, William Charles Wentworth, and Lieutenant Lawson. In November, 1813, George Evans, Deputy Surveyor-General, crossed the Blue Mountains and discovered the Bathurst Plains where and with the colony desperate to find arable lands, and with the colony desperate to find arable lands, where he claimed to see for 50 miles (80 km) and thought he was was gazing at a vast inland sea. He might easily have been misled, for waves upon waves of grass like ocean billows lay stretched before him as far as the eye could see (Lee, 1925). In December, 1816 Evans discovered the O’Connell Plains, a fine plain of rich land, the handsomest country I ever saw… The Macquarie Plains were similarly marvelous: The hills have a look of a park and grounds laid out. I am at a loss for language to describe the country. Of Pine Hill, he wrote, The pine trees have a very romantic appearance. … the largest of them is about four feet in circumference. Governor Macquarie toured extensively in eastern Australia, completing ten tours during 1810 – 1822. Visiting Mr Blaxland’s farm in 1810, he commented that it was a very snug good farm and very like an English one in point of comfort and convenience” (Macquarie, 1956). Being English was to aspire to the ideal! Crossing the Quiraway Creek near the Nepean River was a very pretty part of the country. The Nepean itself is a beautiful situation, rowing up it to enjoy the fine and beautiful scenery of this large river… They halted at a beautiful romantic spot on the right bank of it, forming a sort of natural terrace at the foot of a prodigious high cliff, in order to take our breakfast and view the grand surrounding scenery. It must have been a very late breakfast! The river banks were very high and steep and beautifully grand and picturesque to look at but extremely difficult to pass or travel through on foot from their great steepness and ruggedness (Macquarie, 1956). “a very beautiful table land, which … has very fine picturesque grand scenery, consisting of deep finely wooded glens, stupendous rocks and cliffs, with high distant hills and mountains” (Macquarie, 1956). They passed “a very extensive deep romantic glen, full of very picturesque and wild scenery” which he named Regent’s Glen. They then reached the “termination of the Blue Mountains ending in a very abrupt descent almost perpendicular. Here we halted for a little while to view this frightful tremendous pass, as well as to feast our eyes with the grand and pleasing prospect of the fine low country below us…” (Macquarie, 1956). They entered the Macquarie Plains, the first of which “was most grand and interesting”. After riding through very pretty wooded country we arrived on a height which commanded a very extensive, grand, and noble view of Bathurst Plains extending on both sides of the Macquarie River … The Bathurst Plains very much impressed Macquarie, finding them truly grand, beautiful and interesting, forming one of the finest landscapes I ever saw in any country I have yet visited (Macquarie, 1956). Returning via the Blue Mountains Macquarie once again feasted our eyes with the grand and picturesque of the country below us… Near Prince Regent’s Glen, they found a variety of sublime and grand objects. There is one water fall at least one thousand feet in height to be seen here in awful grandeur (Macquarie, 1956). Later in 1815, Macquarie viewed the wild and grand scenery of the banks of the River Nepean. In 1820, traveling at Lake George (near Canberra) on the Goulburn Plains, he wrote: these fine plains with the adjoining grand lake, skirted on three sides by high hills covered with wood, form altogether a most beautiful landscape.…we were all most highly gratified and delighted with this noble expanse of water, and the surrounding scenery (Macquarie, 1956). The Surveyor-General, John Oxley’s first expedition was to the Lachlan River in 1817 where they passed through a beautiful picturesque country of low hills and fine valleys well-watered…The timber standing at wide intervals, without any brush or undergrowth, gave the country a fine park-like appearance (Oxley, 1820). Reaching the Lachlan River and proceeding down it Oxley despaired at the country: a country which, for barrenness and desolation, can I think have no equal… It was impossible to imagine a prospect more desolate. The whole country in these directions, … was one continued thicket of eucalyptus scrub… The country then improved: the noble lake before me, gave a character to the scenery highly picturesque and pleasing. And near the Macquarie River, we halted in a pretty valley, having a small run of water… From hills they had the most extensive and beautiful prospects… the whole landscape within the compass of our view was clear and open, resembling diversified pleasure grounds irregularly laid out and planted (Oxley, 1820). Of Glenfinlass, “imagination cannot fancy anything more beautifully picturesque than the scene which burst upon us. The breadth of the valley to the base of the opposite gently rising hills was … studded with fine trees; … to the west it was bounded by the lofty rocky ranges …; this was covered to the summit with cypresses and acacia in full bloom (which) gave additional beauty to the scene” (Oxley, 1820). Of the Macquarie River he wrote, “I shall not in this place attempt to describe the rich and beautiful country that opened to our view in every direction. … the river, an object to us of peculiar interest, … between rocky cliffs of vast perpendicular height, and again expanded into noble and magnificent reaches …The scenery on the river is beautifully picturesque, and more magnificent reaches cannot be found in any river; …” (Oxley, 1820). Of the western plains he wrote, “The appearance of the country passed over was most desolate and forbidding, but quite open, interspersed with miserable rocky crags…” However, days later on ascending a hill, “the view which was on all sides presented to our delighted eyes was of the most varied and exhilarating kind.” The next day he was delighted by the “Chains and ridges of low forest hills, (which) stand for the most part detached like islands; varying the scenery in a most picturesque manner” (Oxley, 1820). Later they “halted in a small and beautiful valley near Cockburn River…” and “found it extremely pleasant, from the romantic beauty of the scenery and the freshness of the verdure” (Oxley, 1820) (verdure means fresh, flourishing vegetation). The Sydney River was “beautiful,” and the country was the finest open country, or rather park, imaginable… We halted in a fine and spacious valley, where art, so far as it is an auxiliary of beauty, would have been detrimental to the fresher and simpler garb of nature. Oxley was quite poetic in his descriptions. The beautiful and well-watered country contained several brooks which expanded into extensive sheets of water, which added greatly to the beauty of the scenery. “It is impossible to form a correct idea of the wild magnificence of the scenery without the pencil of a Salvator (Rosa). Such a painter would here find an ample field for the exercise of his genius. How dreadful must the convulsion have been that formed these glens!” (Oxley, 1820). “we were lost in astonishment at the sight of this wonderful natural sublimity, which perhaps is scarcely to be exceeded in any part of the eastern world…the river…falling over a perpendicular rock…, forms this grand cascade…; and if the river had been full, so as to cover its entire bed, it would have been perhaps more awfully grand, but certainly not so beautiful” (Oxley, 1820). Leaving Bathurst in 1828, Sturt observed of the Macquarie River: On the rich and picturesque grounds near the river the angophora prevailed with the flooded gum, and the scenery upon its banks was improved by the casuarinae that overhung them. He wrote, The views upon the river were really beautiful…. (Sturt, 1833). The entered the plains, the view across which was as dreary as can be imagined; in many places without a tree… Near Oxley’s Table Land is picturesque in appearance, and lightly wooded (Sturt, 1833). “we suddenly found ourselves on the banks of a noble river…The channel of the river was from seventy to eighty yards broad, and enclosed an unbroken sheet of water,… the trees that overhung it were of beautiful and gigantic growth.” Later along the Castlereagh, “the country in its neighborhood became extremely depressed and low…(a) wretched appearance of the country…” (Sturt, 1833). Crossing the plains of the Murrumbidgee in 1828, Sturt found the scenery around us was wild, romantic, and beautiful; as beautiful as a rich and glowing sunset in the most delightful climate under the heavens could make it (Sturt, 1833). At Pondebadgery, the party descended towards a beautiful plain…I could not but admire the beauty of the scene. In the midst of the plain, they came upon the River. The Morumbidgee itself, with an increased breadth, … presents a still, deep sheet of water to the view, over which the casuarina bends with all the grace of the willow, or the birch, … (Sturt, 1833). Heading westward on land near the River, the landscape became increasingly barren, It is impossible for me to describe …the dreariness of the view …here and there a stunted gum-tree, or a gloomy cypress, seemed placed by nature as mourners over the surrounding desolation (Sturt, 1833). Reaching the River Murray, a broad and noble river…The river improved upon us at every mile. Its reaches were of noble breadth, and splendid appearance. (Sturt, 1833). Sometime later they encountered the River Darling, a new and beautiful stream, coming apparently from the north. Rowing up the Darling some distance, Sturt was struck by its appearance; Its banks were sloping and grassy, and were overhung by trees of magnificent size. Indeed, its appearance was so different from the water-worn banks of the sister stream, that the men exclaimed, on entering it, that we had got into an English river (Sturt, 1833). Sturt’s boat party rowed into the cliff-lined trench section of the River Murray, A line of cliffs, of from two to three hundred feet in height … They rose perpendicularly from the water, and were of a bright yellow color, rendered still more vivid occasionally by the sun shining full upon them…We passed some beautiful scenery in the course of the day (Sturt, 1833). Heading south, “It would have been impossible for the most tasteful individual to have laid out pleasure ground to more advantage, than Nature had done in planting and disposing the various groups of trees along the spine, and upon the sides of the elevations that confined the river, and bounded the low ground that intervened between it and their base” (Sturt, 1833). After reaching the Murray Mouth, Sturt had to row back up-river, suffering from eye blindness, low in food and with his men exhausted, I would fain have lingered on my way, to examine, as far as circumstances would permit, the beautiful country between the lake and the ranges; and it was with heart-felt sorrow that I yielded to necessity (Sturt, 1833). On Major Thomas Mitchell’s first expedition in 1831-2 between Cumberland and Northumberland, The scenery is fine on those broad and placid waters, sheltered by over-hanging cliffs, 600 feet in height. Near Peel’s River, the herds of cattle browsing in the distance, added pastoral beauty… He later entered an extensive valley, beyond which, I could just perceive …, a majestic chain of mountains extending to the westward. I never felt less love for the picturesque that at that time, for grand as the outline was, I could perceive no opening by which I could hope to cross it (Mitchell, 1839). Near the Namoi River, a beautiful open country lay at its base, … we beheld, for the first time, that fine country… the great range itself formed a sublime horizon on the east, some of the summits having very remarkably pointed or castellated forms (Mitchell, 1839). Crossing the Blue Mountains in 1835, Mitchell was struck by their beauty, This mass of sandstone is intersected by ravines, deep in proportion to the height of the surface, until the profound depth of the vallies …, inclosed by rocky precipices, imparts a wild grandeur to the scenery, of a very uncommon character. At Mount Hay, Mitchell found the scenery immediately around it very wild, consisting of stupendous, perpendicular cliffs, 3000 feet deep, at the foot of which, the silvery line of the Grose, meanders through a green valley… As he reached the Bathurst plains, Mitchell’s words reflected the traditional abhorrence of mountains, the eye of the traveler from Sydney having long sought, in vain, for some relief from the prospect of so much waste mountainous country (Mitchell, 1839). The artist in Mitchell was evident in describing the ‘pine’ trees (Callitris pyramidalis), whose deep green contrasted beautifully with the red and grey tinges of the granite rocks, while their respective outlines were opposed to each other with equally good effect” (Mitchell, 1839). A Darling River lagoon had its shining waters being spread into a horse-shoe shape, and reflecting the images of enormous gum-trees on the banks. It extended also into several bays or sinuosities, which gave the scenery a most refreshing aquatic character (Mitchell, 1839). Heading back along the Bogan River, Mitchell found the scenery very pleasing, Indeed, the beauty of the sylvan scenery on the lower Bogan, may be cited as an exception to the general want of pictorial effect in the woods of New South Wales. The poverty of the foliage of the eucalyptus, the prevailing tree, affords little of mass or shadow; and indeed seldom has that tree, either in the trunk or branches, anything ornamental to landscape (Mitchell, 1839). Mitchell’s third expedition, in 1836, headed west to the junction of the Darling and Murray, then south to Portland, returning to Sydney though Victoria and Yass. “The scenery was highly picturesque …, notwithstanding the dreary level of the naked plains back from them. The “yarra” (River Red Gum) grew here, as on the Darling, to a gigantic size, … and its huge gnarled trunks, wild romantic formed branches often twisting in coils, shining white or light red bark, and dark masses of foliage, with consequent streaks of shadow below, frequently produce effects fully equal to the wildest forest scenery of Ruysdael or Waterloo. Often as I hurried along, did I take my last look with reluctance, of scenes forming the most captivating studies” (Mitchell, 1839). In 1840, Paul Strzelecki, saw the dividing range, here called the Australian Alps, with its stupendous peaks and domes, and in front the beautiful valley which the (River) Murray so bountifully waters; unite to form attractions for the explorer of no ordinary kind. Climbing Mt Kosciuzko, he wrote, The highest of the Australian Alps – it towers over the entire continent – whose summit, before my coming had not been reached by anyone, with its everlasting snows, the silence and dignity surrounding it, … (Kaluski, 1985). Nicolas Baudin, the French captain was not given to include many descriptions of the land in his journal. On 28 March, 1802, he passed Wilson’s Promontory: The promontory is very lofty and consists of two, sometimes three, tiers of mountains following upon each other…The view is only pleasant in the distance, for most of the coast is arid, and the rock forming it shows through to the surface in several places. A few days later, along what later became known as the Great Ocean Road, the western Victorian coast, he described it as high, well-wooded and of pleasant appearance. There are small, insignificant coves with beaches of white sand where the sea sometimes breaks, but always on the shore (Baudin, 1974). “the view was exceedingly beautiful over the surrounding plains,…The scene was different from anything I had ever before witnessed, either in New South Wales or elsewhere. A land so inviting, and still without inhabitants! As I stood, the first European intruder on the sublime solitude of these verdant plains, as yet untouched by flocks or herds; I felt conscious of being the harbinger of mighty changes; and that our steps would soon be followed by men and the animals for which it seemed to have been prepared” (Mitchell, 1839). Heading south west, Mitchell’s party descended on one of the most beautiful spots I ever saw:- The turf, the woods, and the banks of the little stream which murmured through the vale, had so much the appearance of a well kept park… (Mitchell, 1839). “I first obtained a complete view of a noble range of mountains rising in the south to a stupendous height, and presenting as bold and picturesque an outline as ever a painter imagined.” Near the Grampians, Mitchell wrote that he “had at length discovered a country ready for the immediate reception of civilized man: and destined perhaps to become eventually a portion of a great empire. Unencumbered by too much wood, it yet possessed enough for all purposes; its soil was exuberant, and its climate temperate; it was bounded on three sides by the ocean; and it was traversed by mighty rivers, and watered by streams innumerable. Of this Eden I was the first European to explore its mountains and streams – to behold its scenery – to investigate its geological character – and, by my survey, to develop those natural advantages, certain to become, at no distant date, of vast importance to a new people” (Mitchell, 1839). Climbing Mt William in the Grampians, he observed It was evident that the reign of solitude in these beautiful vales was near a close; a reflection which, in my mind, often sweetened the toils and inconveniences of traveling through such houseless regions (Mitchell, 1839). “clumps of lofty trees, giving to the whole the appearance of a park” and “Every day we passed over land, which, for natural fertility and beauty, could scarcely be surpassed; over streams of unfailing abundance, and plains covered with the richest pasturage. Stately trees and majestic mountains adorned the ever-varying scenery of this region, the most southern of all Australia, and the best” (Mitchell, 1839). Traveling south, “on reaching a brow of high land, what a noble prospect appeared! A river winding amongst meadows, that were fully a mile broad, and green as an emerald.” The Glenelg River was passing “through a country far surpassing in beauty and richness any part hitherto discovered.” A “splendid valley resembling a nobleman’s park on a gigantic scale…Each of these vallies presented peculiar and very romantic features, but I could not decide which looked most beautiful. All contained excellent soil and grass,…” Reaching the coast, the “vista being truly picturesque, and with the interest attached to the scene, it looked indeed quite enchanting…on rounding a low rocky point, we saw the green rolling breakers of the sea through an opening, which proved to be the mouth of the river” (Mitchell, 1839). “A finer country could scarcely be imagined; enormous trees of the mimosa or wattle…The sublime peaks of the Grampians began to appear above the trees to the northward…” Climbing Mount Abrupt, Mitchell “beheld a truly sublime scene; the whole of the mountains, quite clear of clouds, the grand outline of the more distant masses blended with the sky, and forming a blue and purple background for the numerous peaks of the range … which consisted of sharp cones and perpendicular cliffs foreshortened, so as to form one grand feature only of the extensive landscape,… “ Near Mt Abrupt were several “small and very picturesque lakes, then as smooth as mirrors…past spots like these, involving in their unexplored recesses so much of novelty amidst the most romantic scenery” (Mitchell, 1839). Mitchell named the western Victorian region, Australia Felix, the better to distinguish it from the parched deserts of the interior country, where we had wandered so unprofitably, and so long (Mitchell, 1839). Governor Lachlan Macquarie visited Van Diemen’s Land (as Tasmania was originally known) in 1811. His party sailed up the River Derwent to Hobart, overlooked by Mount Wellington, the lofty beautiful hilly banks of which are extremely grand and picturesque; … The view from Government Farm is beautiful and extensive, having a very pretty rivulet of fresh water running at the back of it,… Macquarie’s party visited nearby New Norfolk through beautiful rich and picturesque country… Riding north they traveled through a very fine, fertile, and beautifully picturesque country … The Antill Plains, the Macquarie Plains and the Henrietta Plains were all beautifully interspersed with trees, and the latter were by far the richest and most beautiful we have yet seen in Van Diemen’s Land, forming a grand, and interesting fine landscape and having a fine noble view of Ben-Lomond, … the New River, or South Esk, meandering in a beautiful manner through the plains making the landscape complete (Macquarie, 1956). “grand view and noble picturesque landscape, that presented themselves on our first coming in sight of Launceston and the trees, rivers, and fertile plains and lofty mountains by which they are bounded, were highly gratifying and truly sublime, and equal in point of beauty to anything I have ever seen in any country” (Macquarie, 1956). High praise indeed! “we were very highly gratified and pleased with it and the grand picturesque scenery of the surrounding hills and high rocks which tower above it, and confines within a narrow chasm the channel or bed of the river, foaming through this narrow gap in a most beautiful manner” (Macquarie, 1956). In 1841, Strzelecki was also delighted with the scenery in Van Diemens Land and found its suggestion of familiarity comforting, Spots teeming with gigantic and luxuriant vegetation … which lack only the thatched and gabled cottage with its blue smoke curling amid the trees, to realize a purely European picture… (Kaluski, 1985). In 1844 Captain Charles Sturt led an expedition to find an inland sea in Central Australia; he even carted a boat along! “and at once found ourselves on the brink of a fine pond of water, shaded by trees and cliffs. The scenery was so different from any we had hitherto seen, that I was quite delighted.” From there they headed out across “one of the most gloomy regions man ever traversed. The stillness of death reigned around us, no living creature was to be heard; nothing visible inhabited that dreary desert but the ant… The whole landscape however was one of the most gloomy character, and I found myself obliged to turn from it in disappointment” (Sturt, 1849). “I looked to the west and saw a beautiful park-like plain covered with grass, having groups of ornamental trees scattered over it. Whether it was the suddenness of the change, from barrenness and sterility to verdure and richness, I know not; but I thought, when I first gazed on it, that I never saw a more beautiful spot.” They rode through the area “There was grass under the trees, and the scenery as we rode along was really cheerful” (Sturt, 1849). Grass, essential for the horses, always made explorers cheerful. “In the direction I was about to proceed, nothing was to be seen by the gloomy stone-clad plain, … Ignorant of the existence of a similar geographical feature in any other part of the world, I was at a loss to divine its nature” (Sturt, 1849). “We passed through some very pretty scenery in the proximity of the lagoon … and I could not help reflecting with how much more buoyant and pleasurable feelings we should have explored such a country, when compared with the monotonous and sterile region we had wandered over. The transition however from the rich to the barren, from the picturesque to the contrary, was instantaneous” (Sturt, 1849). “They are indeed most splendid water holes … and the scenery is beautiful.” At Davenport Creek he “came upon a beautiful spring in the bed of the creek, for which I am truly thankful. I have named this ‘The Spring of Hope’” (Stuart, 1865). To Stuart, beauty was often associated with green grass for his horses, The sand hills again commenced with beautiful feed upon them – low, with broad valleys… At Mount Younghusband, he found the feed is splendid right to the top of the mount. It is a wonderful country, scarcely to be believed. Near the Mount, he found large springs, The flow of water from them is immense, … and the country around is beautiful (Stuart, 1865). Stuart’s fourth expedition set out in March 1860 to fix the center of Australia. Grass was again beautiful; at Mount Humphries we passed over a plain of as fine a country as any man would wish to see – a beautiful red soil covered with grass a foot high (Stuart, 1865). “a pillar of sandstone, standing on a hill upwards of one hundred feet high. From the base of the pillar to its top is about one hundred and fifty feet, quite perpendicular; … with two small peaks on top. I have named it Chambers Pillar … To the north and north-east of it are numerous remarkable hills, which have a very striking effect in the landscape; they resemble nothing so much as a number of old castles in ruins; they are standing in the midst of sand hills” (Stuart, 1865). Stuart found the hills to be covered with spinifex but the valleys were beautifully grassed. On his fifth expedition, Stuart found the McDonnell Ranges to contain, seams of beautiful grey granite crossing the creek, and abundance of marble of all colors… he again found beauty in grass, particularly “beautiful grassy plains”. In the Murchison Range near Tennant Creek he found a beautiful waterfall, upwards of one hundred feet high… Later Stuart crossed the Sturt Plains which he named after Charles Sturt, It is covered with splendid grass, and is a fine a country as I have ever crossed (Stuart, 1865). In Stuart’s sixth expedition, from a hill near Blue Swamp he had a good view of the surrounding country – to all appearance one of the blackest and most dismal views a man every beheld due to dense tree cover. “deep and beautifully clear”, with “beautifully grassed country”. “The water of (the Roper) river is most excellent; … the grass, although dry, most abundant, from two to five feet high. This is certainly the finest country I have seen in Australia” (Stuart, 1865). “The plains are studded with lines of green gum-trees, and the cabbage palms are numerous, which give them a very pretty park-like appearance.” Elsewhere “a grassy plain of a beautiful black alluvial soil, covered with lines and groves of the cabbage palm trees, which give it a very picturesque appearance;…” (Stuart, 1865). In 1873, William Gosse traveled from Alice Springs west along the MacDonnell Ranges, south to Mt Olga, discovered Ayers Rock, then went west along Mann Ranges in Western Australia and back east to the Musgraves, the Alberga River and the Adelaide-Darwin telegraph line. “This rock appears more wonderful every time I look at it, and I may say it is a sight worth riding over eighty-four miles of spinifex sandhills to see…The rock presented a grand appearance this morning; close to our camp was a waterfall about 200 feet high, the water coming down in one sheet of foam…The waterfalls are really beautiful” (Gosse 1874). “Mount Olga … about twenty miles west… This is a high mass of granite … This rock is certainly the most wonderful natural feature I have ever seen. What a grand sight this must present in the wet season; waterfalls in every direction” (Gosse 1874). Leaving Ayers Rock, Gosse traveled over sandy ground with beautiful grass and herbs… But then came the sandhills, sandhills as far as I could see…this is certainly the most wretched lookout I have had; there are sandhills all round, … (Gosse 1874). In the 1870s, Ernest Giles conducted several expeditions in Central Australia, enduring great hardships, the loss of some of his horses through thirst, and the heat and trials of the outback. Through it all, he remained cheerful and his journal has wonderful descriptions of the places he visited. In 1874, he came to Chambers Pillar of which Giles wrote We turned our backs upon this peculiar monument, and left it in its loneliness and its grandeur – ‘clothed in white sandstone, mystic, wonderful!’ (Giles 1889). “grandeur, picturesqueness, and variety…I was literally surrounded by fair flowers of every changing hue. Why Nature should scatter such floral gems upon such a stony sterile region it is difficult to understand, but such a variety of lovely flowers of every kind and color I had never met with previously. Nature at times, indeed, delights in contrasts, for here exists a land ‘where bright flowers are all scentless, and songless bright birds’” (Quote from the poem, The Dedication by Adam Lindsay Gordon). “How beautiful is the color of green! What other color could even Nature have chosen with which to embellish the face of the earth? How, indeed, would red, or blue, or yellow pall upon the eye! But green, emerald green, is the loveliest of all Nature’s hues” (Giles 1889). The party camped “in an extremely pretty and romantic valley; the grass was green and Nature appeared in one of her smiling moods, throwing a gleam of sunshine on the minds of the adventurers who had sought her in one of her wilderness recesses” (Giles 1889). Poetic indeed! East of the Musgraves he wrote, “The country … was exceedingly beautiful; hills being thrown up in red ridges of bare rock, with the native fig-tree growing among the rocks, festooning them into infinite groups of beauty…The place was so exquisitely lovely it seemed as if only rustic garden seats were wanting, to prove that it had been laid out by the hand of man. But it was an instance of one of Nature’s freaks, in which she had so successfully imitated her imitator, Art” (Giles 1889). “the scenery most beautiful – pine-clad, red, and rocky hills being scattered about in various directions … This spot is one of the most charming that even imagination could paint. In the background were the high and pointed peaks of the main chain, from which sloped a delightful green valley; through this the creek meandered, here and there winding round the foot of little pine-clad hills of unvarying red color, whilst the earth from which they sprung was covered with a carpet of verdure and vegetation of almost every imaginable hue. It was happiness to lie at ease upon such a carpet and gaze upon such a scene, and it was happiness the more ecstatic to know that I was the first of a civilised race of men who had ever beheld it” (Giles 1889). “Here I had found a spot where Nature truly had “Shed o’er the scene her purest of crystal, her brightest of green.” (Quote from a poem, The Meeting of the Waters by Thomas Moore, 1779 – 1852) This was really a delightful discovery. Everything was of the best kind here – timber, water, grass, and mountains. In all my wanderings, over thousands of miles in Australia, I never saw a more delightful and fanciful region than this, and one indeed where a white man might live and be happy” (Giles 1889). Giles was in one of the most inhospitable regions in Australia, dry, hot and remote yet he found pleasure in it. Giles’s party came on Mt Olga and was amazed by it The appearance of Mount Olga is truly wonderful; it displayed to our astonished eyes rounded minarets, giant cupolas, and monstrous domes. There they stood as huge memorials of the ancient times of earth, for ages, countless eons of ages, since its creation first had birth (Giles 1889). “we walked up to the foot of the cascade, along the margin of the transparent stream, …we found the rocks rose almost perpendicularly from a charming little basin, into which the stream from above and the spray from below mingled with a most melodious sound, so pleasant to the ear at any time, but how much more to our drought-accustomed senses; …There were gorges to the right of us, gorges to the left of us, and there was a gorge all round us” (Giles 1889). In 1817, Allan Cunningham, a botanist, traveled with John Oxley, the Surveyor-General, to King’s Table Land in the Kimberley in the north-west of WA. He was astonished at his first views, at the top of a hill, an opening presents to us a grand romantic expanse of country; mountains running beyond mountains to the very verge of the horizon, striking the beholder with admiration and astonishment (Lee 1925). Other places however, presented a sterile and dreary aspect and the appearance of these plains is that of a gloomy desert with stunted trees and dry wiry tufts of grass. A place called Glen Finlas with rocky elevated hills on each side, has a very picturesque appearance. Journeying through the Glen they came to a most beautiful spacious valley, thinly clothed with timber of moderate size … plentifully watered by a rapid, limpid rivulet winding through its centre, which being connected with encircling lofty hills, thickly covered with cypress to their summits, beautifies the vale exceedingly (Lee 1925). “On two sides the view was bounded by lofty cliffs, … broken by wide openings, into which ran arms of the sea, forming gloomy channels of communication with the interior country; while on each side of their entrances the huge cliffs rose, like the pillars of some gigantic portal” (Grey 1841). “The romantic scenery of this narrow glen could not be surpassed. …lofty paper-bark trees grew here and there, and down the middle ran a beautiful stream of clear, cool water, …and formed a series of small cascades … the beauty of the landscape, and the solicitude we all felt to see more of this unexplored land, cheered us on…The trees were lofty, and some of them of considerable circumference; … strikingly graceful foliage, gave them a most picturesque appearance” (Grey 1841). A month later, he observed, Lofty mountains crowned with castellated summits, rear their sterile heads over the broad waters, and fling their giant shadows on the bosom of the (St George’s) basin, forming a scene of surpassing beauty. “From the summit of the hills … stretched a low luxuriant country, broken by conical peaks and rounded hills, which were richly grassed to their very summits. The plains and hills were both thinly wooded, and curving lines of shady trees marked out the courses of numerous streams. Since I have visited this spot, I have traversed large portions of Australia, but have seen no land, no scenery to equal it” (Grey 1841). They “traversed a most beautiful country this morning, composed of basaltic rocks and fine alluvial soil,…”. Later they “traveled all day, through a very fertile and picturesque country… on our right extensive plains, through which ran the Glenelg” (River). “consisted principally of a range of elevated hills from which streams were thrown off to the Glenelg, and to Prince Regent’s River. The scenery here was very fine,…I can compared this to no other Australian scenery, for I have met with nothing in the other portions of the continent which at all resembles it.” Grey philosophized, “I sat in the fading light, looking at the beautiful scenery around me, which now for the first time gladdened the eyes of Europeans…” (Grey 1841). In late 1838 and early 1839, Grey led another expedition south east of Perth and then north to Shark Bay. A gorge in the Darling Range was replete with most wild and beautiful scenery at this point, – the river comes streaming out from a rocky mountain pass, forming in its course a series of small cataracts. Further into the Range they came upon a beautiful valley, between two steep and high hills. Two streams poured down into this valley, and there formed a small fresh-water lake… the whole wore such an air of highland mountain scenery, that I could readily have imagined I was once more in Scotland (Grey 1841). When on the coast near Kalbarri after wrecking the whaleboat in surf, Grey seem unconcerned as he ascended a hill to reconnoiter our present position, and found we were in a country of a pleasing and romantic appearance… Walking along a path, we found a most romantically-situated native well, surrounded by shrubs and graceful wattle trees,. .. thus surrounded with such fairy scenery, a variety of philosophic reflections crossed our minds, and found vent in words. Nothing could be more delightfully romantic than our present position (Grey 1841). At the Hutt River, we found ourselves at the head of a large and picturesque estuary … Whilst I stood and looked at this scene, my woes were forgotten. Such moments as these repay an explorer for much toil and trouble (Grey 1841). In 1876 Giles journeyed from Beltana to Perth via the Nullarbor Plain. At Fowlers Bay on the far west coast of South Australia, he commented on, the spindrift and the spray of the Southern Ocean, with the glorious main expanding to the skies. Much further west and north at a place called Ooldabinna, on the shores of a salt lake, he remarked on the very pretty scene, though in such a frightful desert (Giles 1889). At Ullaring, Ernest Giles found a very pretty piece of scenery. Several hundred acres of bare rocks, with grassy flats sloping down from them to the west, and forming little watercourses or flat water-channels. Later, again at Ullaring, he wrote again that it is altogether a most romantic and pretty place; the little grassy channels were green and fresh-looking, and the whole space for a mile around open, and dotted with shady acacia trees and bushes (Giles 1889). “delightful and truly Australian scene…This valley is three or four miles wide, and beautifully green. It is bounded … by abrupt-faced ranges of hills, while down through the centre of the grassy plain stretch serpentine lines of vigorous eucalyptus-trees, pointing out the channels of the numerous watercourses into which the river splits” (Giles 1889). “ascended a hill close by the camp; the scene was indeed most extraordinary, bald and abrupt hills, mounts and ranges being thrown up in all directions; they resemble the billows of a tempestuous ocean suddenly solidified into stone, or as though a hundred thousand Pelions had been upon as many million Ossas hurled, and as though the falling masses, with super incumbent weight, falling, flattened out the summits of the mountains low but great” (Giles 1889). Giles’ classical education is apparent here. John Forrest’s second expedition in 1870 was along the Western Australia coast to South Australia. Just east of Esperance Bay he described the country for the last few miles is beautifully grassed, with numerous brackish streams running through. He used the term beautifully grassed a number of times, interspersed with the most miserable country, thickets and spinifex… (Forrest 1875). Reaching the 300 feet (90 m) Nullarbor cliffs, they were stricken: we reached the cliffs, which fell perpendicularly into the sea, and, although grand in the extreme, were terrible to gaze from. After looking very cautiously over the precipice, we all ran back quite terror-stricken by the dreadful view. This is the sublime in operation, but without a safety net. He wrote of those grand precipitous cliffs, from 200 to 300 feet high… (Forrest 1875). On his third expedition into northern Western Australia in 1874, at Mount Davis he reported, Spinifex in every direction, and the county very miserable and unpromising” and later, “spinifex country of the most wretched description. The country all the way, in fact, is most miserable and intolerable. Then relief, The country is most beautifully grassed, and is a great relief after traveling over so many hundreds of miles of spinifex (Forrest 1875). Traveling north through central Queensland in 1844, Leichhardt described the Brigalow vegetation, The scrub opens more and more; a beautiful country with Bricklow groves, and a white Vitex in full blossom. A few days later, he referred to the beautiful undulating country, until arrested by a Bricklow scrub, …. The picturesque was used in the following description, This vale was one of the most picturesque spots we had yet seen. An Ironbark tree, with greyish fissured bark and pale-green foliage, grows here,… (Leichhardt 1847). “The feelings of delight which I experienced when, upon emerging from the more than usually inhospitable Bricklow scrub, the dark verdure of a swamp surrounding a small lake…backed by an open forest, in which the noble palm tree was conspicuous – suddenly burst upon our view, were so great as to be quite indescribable” (Leichhardt 1847). Near Mt Stewart, Leichhardt wrote of the most beautiful, open, silver-leaved Ironbark forest, changing occasionally into plains without a tree. Later, he wrote, This would be a most beautiful country, if it contained a constant supply of water (Leichhardt 1847). Entering into hilly country Leichhardt enjoyed a “fine view” from a plateau he called the Four Arches. A valley that had been burnt was not covered with “delightful verdure” which, together with creeks and a belt of trees gave to this beautiful country the aspect of a large park (Leichhardt 1847). Matthew Flinders and Nicolas Baudin sailed separately along the coast of South Australia in 1802 on voyages of discovery. 1. Cape Leeuwin (WA). 2. Cape Chatham (WA). 3. Eclipse Island (WA). 4. Seal Island (King George Sound, WA). 5. Middle Island (Recherche Archipelago, WA). 6. Cliffs in the Great Australian Bight (SA). Artist: William Westall. National Library of Australia. “The stretch of coast that we had been following since yesterday consisted entirely of sand dunes which inspired nothing but sadness and regrets. Quite apart from the wretched and unpleasant appearance of this shore, the sea breaks all the way along it with extraordinary force… But towards three o’clock we began to see some high terrain (Mt Lofty Ranges) which looked as if it must be pleasant” (Baudin 1974). Baudin “sailed along a fairly long stretch of the eastern coast of Kangaroo Island … The hinterland looks quite pleasant and, although most of the trees had lost their leaves, there remained enough greenery for the view to be attractive” (Baudin 1974). “The two coasts differ greatly from each other; the starboard coast is formed by a range of high mountains (Mt Lofty Ranges) with little vegetation, whereas the one opposite (Yorke Peninsula) is flat and even, with only two or three rises formed by sand-hills that could serve as landmarks” (Baudin 1974). 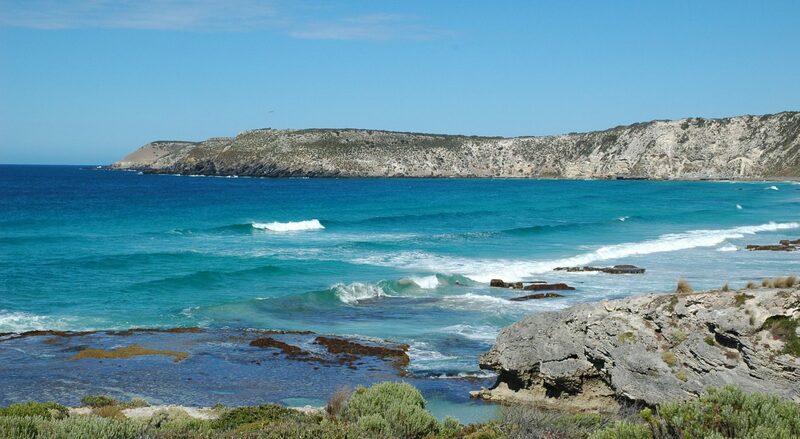 Fornasiero et al, 2010 Profile of the western coast of Kangaroo Island from Baudin’s voyage Cape Borda (g) and the Ravine des Casoars (Cassowary Ravine) (h). Charles-Alexandre Lesueur. Published in the Atlas of the Voyage de découvertes aux Terres Australes 1807. Colonel William Light, the Surveyor-General, arrived in Adelaide in September 1836, first visiting localities south of Adelaide. He described Rapid Bay as a beautiful little valley in view… I went on shore, and was enchanted with the appearance of the whole. A fine stream of fresh water ran through the middle of the valley into the sea, and the soil was rich beyond my expectations... (Light 1984). Walking across the Adelaide plains, he wrote, having traversed over nearly six miles of a beautiful flat, I arrived at the river, and saw from this a continuation of the same plain for at least six miles more to the foot of the hills under Mount Lofty, which heights trending to the sea in a south-westerly direction… He described the site for Adelaide in January 1837, it was on a beautiful and gently rising ground, … and in a letter to the Commissioners, The beautiful and romantic spot that is at present marked out for the City of Adelaide has accordingly been chosen, … He said, Adelaide, is, unquestionably, a beautiful spot, for agricultural purposes altogether unexceptionable, … (Light 1984). Clearly the beauty of the site strongly influenced Light’s selection. “situation of Adelaide is pleasing and picturesque; it is surrounded by rich level land with park-like scenery, and backed by a range of bold mountains, that in their every-varying tints afford a constant succession of delightful pictures throughout the day” (Angas 1847). “an undulating hilly country, lightly wooded withal, and containing many very rich, if not beautiful valleys. The Barossa Ranges and the districts round it are exceedingly pretty. The Keizerstuhl (Mt Kaiserstuhl) the outline of which is really beautiful,… Angas Park (Angaston) is a place of great picturesque beauty, and is capable of being made as ornamental as any nobleman’s estate in England” (Angas 1847), obviously the highest accolade. “The hills are intersected by luxuriant valleys, and the manner in which the trees are grouped about conveys the idea that it is one immense park, skilfully arranged by the hand of man, rather than a natural paradise prepared for his reception…” (Angas 1847). In this theme, the more significant aesthetic assessments by 18 explorers on 48 expeditions throughout Australia have been examined. While it might have been assumed that explorers are not given to express personal feelings, especially about the attractiveness of the landscape, the evidence suggests otherwise. The accounts of some explorers, such as Oxley, Mitchell and Giles are replete with adjectives describing landscape beauty. For men who came mainly from England (and Scotland), it is surprising to read how appreciative they were of the often harsh Australian landscape. Some could barely contain themselves, so moved were they by the country they were seeing it for the first time. While for many explorers, an attractive landscape was one which provided grass for their horses and water for their party, they also appreciated landscapes without these characteristics. For many, there was a clear relationship between the potential productivity of the land following settlement and its landscape beauty. Mitchell’s Australian Felix of western Victoria was obviously viewed in these terms. As well as describing the objective characteristics such as the soil, water, vegetation, suitability for settlement and agriculture, they also frequently commented on the aesthetic qualities present. The explorers found landscape beauty in almost all of the areas encountered ranging from arid and temperate grassland, park-like environments, tropical, alpine and arid vegetation, water wherever it was found, plains, hills and mountains. Giles found beauty amidst some of the most inhospitable country in Central Australia. Yet they all found spinifex dreadful and Sturt despaired on seeing the Stony Desert. Captain James Cook’s description when he first saw Australia at Point Hicks in eastern Victoria was not very promising: What we have as yet seen of this land appears rather low and not very hilly, the face of the Country green and woody but the sea shore is all a white sand. Over the next century, this brief description was expanded on by many explorers. Landscapes with a park-like appearance comprising large scattered trees with lush grass reminded explorers of England, and in particular, the estates of noblemen. Invariably, these were regarded as fine attractive landscapes. Macquarie passed through beautiful rich park-like tract of country near Mittagong. Mitchell crossed plains before crossing the River Murray in which detached groups of trees gave to the country a park-like appearance… Later passing near the Glenelg River he described a country far surpassing in beauty and richness any part hitherto discovered…a splendid valley resembling a nobleman’s park on a gigantic scale. Oxley found at Limestone Creek, The timber standing at wide intervals, without any brush or undergrowth, gave the country a fine park-like appearance. Stuart nearing the northern coast on his sixth expedition found The plains are studded with lines of green gum-trees, and the cabbage palms are numerous, which give them a very pretty park-like appearance. Sturt near Lake Bonney described an extensive, well wooded and grassy flat of beautiful and park-like appearance. And at Lake Victoria and even up the River Darling Sturt found a beautiful park-like plain covered with grass, having groups of ornamental trees scattered over it. Later resident in Adelaide, he wrote: In many places (in the Province) the trees are so sparingly, and I had almost said judiciously, distributed as to resemble the park lands attached to a gentleman’s residence in England, and it only wants the edifice to complete the comparison. George Fife Angas traveled through the fledgling colony of South Australia and found park-like landscapes in abundance. He described the situation of Adelaide is pleasing and picturesque; it is surrounded by rich level land with park-like scenery, and backed by a range of bold mountains. In the Barossa Valley, Angas Park (Angaston) is a place of great picturesque beauty, and is capable of being made as ornamental as any nobleman’s estate in England. Many of the explorers were so moved by the landscapes through which they were traveling that they declared them the best they had seen. Governor Macquarie on seeing the Bathurst Plains, truly grand, beautiful and interesting, forming one of the finest landscapes I ever saw in any country I have yet visited. In Van Diemen’s Land he described the Henrietta Plains by far the richest and most beautiful we have yet seen …, forming a grand, and interesting fine landscape and having a fine noble view of Ben-Lomond… Nearing Launceston, Governor Macquarie described the grand view and noble picturesque landscape…equal in point of beauty to anything I have ever seen in any country. Captain Charles Sturt when crossing the plains to the Murrumbidgee, wrote the scenery around us was wild, romantic, and beautiful; as beautiful as a rich and glowing sunset in the most delightful climate under the heavens could make it. Fifteen years later, on his northern expedition, north of Depot Glen, I know not; but I thought, when I first gazed on it, that I never saw a more beautiful spot. On John McDouall Stuart’s fourth expedition, at Mount Humphries, we passed over a plain of as fine a country as any man would wish to see – a beautiful red soil covered with grass a foot high. And of Roper River, This is certainly the finest country I have seen in Australia. When he saw Mt Olga, William Gosse exclaimed, This rock is certainly the most wonderful natural feature I have ever seen. What a grand sight this must present in the wet season; waterfalls in every direction. Ernest Giles found the Musgrave Ranges breathtaking, the scenery most beautiful…This spot is one of the most charming that even imagination could paint. North of Birthday Creek in the Musgraves, Giles waxed lyrical, This was really a delightful discovery. Everything was of the best kind here – timber, water, grass, and mountains. In all my wanderings, over thousands of miles in Australia, I never saw a more delightful and fanciful region than this. Giles was in one of the most inhospitable regions in Australia, dry, hot and remote yet he found pleasure in it. George Grey was enamored by the Kimberley, Since I have visited this spot, I have traversed large portions of Australia, but have seen no land, no scenery to equal it. Further on, he judged the landscape of hills near the Prince Regent’s River. The scenery here was very fine…I can compare this to no other Australian scenery, for I have met with nothing in the other portions of the continent which at all resembles it. Explorers often had to cope with barren, miserable country as well as the outstanding. On Charles Sturt‘s northern expedition he discovered the desolate Stony Desert which he had to cross. North of his base at Depot Glen he came to one of the most gloomy regions man ever traversed. The stillness of death reigned around us, no living creature was to be heard; nothing visible inhabited that dreary desert but the ant…The whole landscape however was one of the most gloomy character, and I found myself obliged to turn from it in disappointment. It would be hard to find any saving grace with this landscape. Thus many of the explorers experienced the full range of aesthetic emotions, the highs as well as the lows. Generally, the highs, or at least the pleasant and satisfactory, far outweighed the miserable. The nineteenth century was the aesthetic century when landscape painting came to the fore (See theme: Landscape Art), and the influence of the sublime, picturesque and romantic were strong. The evidence for this is in the language used by the explorers to describe the aesthetic quality of the landscapes they viewed. In addition to the use of the words sublime, picturesque and romantic, the explorers used words such as beauty, beautiful, pretty and fine. The frequency of their use of these words is summarized by Table 2. It was not the standard aesthetic or artistic descriptors (sublime, picturesque, romantic) which dominated but rather the more common adjectives – pretty, beauty, beautiful, and fine. Some explorers, Cook, Flinders and Evans, did not use any adjectives, thus avoiding subjectivity, while others, Macquarie, Oxley, Mitchell, and Sturt frequently used adjectives. Table 3 lists the ways in which the adjectives were used. Although “sublime” had largely gone out of fashion by 1820, it was still used into the 1840s. “Picturesque” was mainly used in the 1810s and 1830s and dropped off in use in subsequent decades. “Romantic” was used relatively infrequently and mainly prior to 1850. Landscape beauty occurs wherever you have the eye to see it. It can occur in the most unlikely of places, in some of the most inhospitable locations, and even in the direst of circumstances such as when Grey lost his whaleboat when beaching it through surf, and they were faced with a long trek to their base. Despite this, he found the country of a pleasing and romantic appearance. The explorers were generally optimistic and positive in their assessments. Certainly, they were not averse to describe barren hot plains as miserable and spinifex as dreadful but these were far outweighed by their positive comments. Coming as they largely did from the temperate landscapes of England, they could be excused for finding the Australian landscapes harsh, forbidding and unpleasant. While they often did find them harsh and forbidding, they were quick to observe the landscape’s positive features and qualities. Although some compared the landscapes with those of their homeland, this was always in a positive way. The prevailing aesthetic notions of the era regarding the picturesque and Romantic were reflected in many of the explorers’ accounts, the sublime less so. The picturesque was found particularly applicable to the Australian landscape. Angas, G.F., 1847. Savage Life and Scenes in Australia and New Zealand: Being an Artist’s Impressions of Countries and People at the Antipodes. Smith, Elder, and Co, London. Baudin, N., The Journal of Post Captain Nicholas Baudin, Commander-in-Chief of the Corvettes Geographe and Naturaliste Assigned by Order of the Government to a Voyage of Discovery. Trans. from French C. Cornell. Libraries Board of South Australia, 1974. Forrest, J., 1875. Explorations in Australia. Sampson Low, Marston, Low, & Searle. London. Giles, E., 1889. Australia Twice Traversed: The Romance of Exploration, being a Narrative Compiled from the Journals of Five Exploring Expeditions into and Through Central South Australia, and Western Australia, from 1872 to 1876. 2 vols. Sampson Low, Marston, Searle & Rivington, London. Gosse, W. C., 1874. Report and Diary of Mr. W.C. Gosse’s Central and Western Exploring Expedition, 1873. Parliamentary Papers, no 48. Libraries Board of SA Facsimile Editions No. 71. Grey, G., 1841. Journals of Two Expeditions of Discovery in North-West and Western Australia, during the years 1837, 38, and 39. T. and W. Boone, London. Lee, I., 1925. Early explorers in Australia from the Log-books and Journals, Including the Diary of Allan Cunningham, Botanist, from March 1, 1817, to November 1818. Methuen & Co. Ltd. London. Leichhardt, Dr L. Journal of an Overland Expedition in Australia, from Moreton Bay to Port Essington, a Distance of Upwards of 3000 miles, During the Years 1844 – 1845. R & W Boone, London, 1847. Corkwood Press, Adelaide, 2000. Light, W., William Light’s Brief Journal and Australian Diaries, David Elder (Introduction & notes) Wakefield Press, Adelaide, 1984. Macquarie, L., Governor of New South Wales. Journals of His Tours in New South Wales and Van Diemen’s Land 1810 – 1822. Published by the Trustees of the Public Library of New South Wales, 1956. Oxley, J., Surveyor General, NSW, 1820. Journals of Two Expeditions into the Interior of New South Wales, Undertaken by Order of the British Government in the Years 1817 – 18. John Murray, London. Facsimile, Public Library of SA. 1964. Stuart, J., The Journals of John McDouall Stuart During the Years 1858, 1859, 1860 & 1862. Ed. W. Hardman. Saunders, Otley & Co, London. 1865. 2nd Ed. Facsimile Libraries Board of SA, 1975. Sturt, C. Captain, 1833. Two Expeditions into the Interior of Southern Australia During the Years 1828, 1829, 1830 and 1831. Smith Elder and Co, London. Sturt, C. Captain, 1849. Narrative of an expedition into Central Australia During the Years 1844, 5 & 6. T. & W. Boone, London. Australian Encyclopedia, 2007. Australian Explorer Chronology. Carter, P., 1990. Plotting Australia’s explorer narratives as “spatial history.” Yale Journal of Criticism, 3: 2, 91. Clune, F., 1942. Last of the Australian Explorers: The Story of Donald Mackay. Sydney: Angus & Robertson. Erdos, R.F., 1963. Ludwig Leichhardt, 1813 – 1848. Fitzpatrick, K., 1958. Australian Explorers: A Selection from their Writings. London; New York: Oxford University Press. Fitzpatrick, K., 1969. Leichhardt: A Great Australian Explorer: Review, Geog. Jnl., 135, 67. Fornasiero, J., P. Monteath, J. West-Sooby, 2010. Encountering Terra Australis. The Australian Voyages of Nicolas Baudin and Matthew Flinders. Wakefield Press, Adelaide. 2nd Ed. Gee, P.D., 1995. John McDouall Stuart, South Australian Explorer: The Search for Wingilpin – Tracking Part of His 1858 Exploration. South Australian Geographical Jnl, 94. Green, L., 1963. Ernest Giles. Melbourne. Grimm, George, G., 1888. The Australian Explorers: Their Labours, Perils and Achievements Being a Narrative of Discovery from the Landing of Captain Cook to the Centennial Year. George Robertson, Melbourne. Kaluski, M., 1985. Sir Paul E. Strzelecki, A Polish Count’s Explorations in 19th Century Australia. Australian Educa Press. Kennedy, D., 1958. Captain Charles Sturt. Oxford University Press. Mack, J.D., 1966. Matthew Flinders 1774 – 1814. Thomas Nelson, Melbourne. Mattingley, D., 1961. Matthew Flinders 1774-1814 and George Bass 1771-1803, Oxford University Press. McLaren, I. F., 1988. Australian Explorers by Sea, Land and Air, 1788-1988. University of Melbourne Library. Monteath, P., 2002. Sailing with Flinders – The journal of Samuel Smith. Corkwood Press. Mossenson, D., 1960. Sir John Forrest, 1847 – 1918. Rienits, R., 1969. James Cook, 1728 – 1779. Voyages and Travels. Ryan, S., 1994. The aborigines in journals of Australian exploration. Ariel, 25:3, 95.